Of all the natural disasters, fire is the only one that is both beneficial to man and his environment as well as destructive and deadly. Man has depended on it for centuries for things from cooking and heating to a major source of lighting. And yet, thousands of people die each year as a result of either house fires or wildfires, with direct property loss estimated at $8.6 billion annually. You are only going to find fires in two places - and it makes sense - indoors or outdoors. Outdoors will be your forest fires or wildfires. Indoors will be building fires and house fires. Fires need three things if they are going to continue to burn: Oxygen, heat and fuel. So, if you want to stop a fire, you have to eliminate at least one of those elements. Take away the oxygen and you can extinguish a fire. Take away the fuel, and you can put out a fire. Electrical accidents or neglect - misuse of wiring and electrical appliances, leaving a curling iron on, or an electric blanket, shorting out of small appliances such as lamps, toasters and even baby monitors. Smoking – a dropped cigarette or children playing with matches and lighters, inadequate ashtray. Kitchen accidents – unattended pots on the stove or the burner being left on accidentally. Heating equipment – space heaters, gas heaters, wood stoves, and fireplaces, mainly in winter months. Portable heaters can be knocked over or placed too close to flammable materials, or they are inadequately guarded. All heaters could overheat if obstructed. Burning refuse/rubbish – accumulating in work or storage areas. Hazardous goods – materials such as paints, adhesives or other chemicals. Arson – by mischievous children and adults, facilitated by ineffectively secured buildings. Specific hazards – machinery in dusty environments, heated equipment (e.g. soldering irons), lamps, cutting and welding equipment, flammable liquids. To protect yourself, you should know how fires spread. It spreads quickly; there is no time to gather valuables or make a phone call. In just two minutes, it can become life-threatening. In five minutes, a residence can be engulfed in flames. The heat and smoke can be more dangerous than the flames. Inhaling the super-hot air can sear your lungs. Fire produces poisonous gases that make you disoriented and drowsy. Instead of being awakened by a fire, you may fall into a deeper sleep. 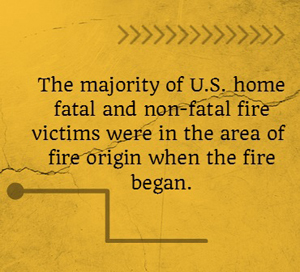 Asphyxiation is the leading cause of fire deaths, exceeding burns by a three-to-one ratio. Fires can spread so quickly. Please be prepared and make sure your family is aware of the emergency plans you have in place. Practice your evacuation plan regularly so everyone knows what to do, where to meet and how to get out of your home quickly. The threat for people living near wildland areas or using recreational facilities in wilderness areas is real. Dry conditions at various times of the year and in various parts of the United States greatly increase the potential for of this type of natural disaster. Advance planning and knowing how to protect buildings in these areas can lessen the devastation. There are several safety precautions that you can take to reduce the risk of losses. To reduce the risk, you'll need to consider the topography of your property and the nature of the vegetation close by. Learn about the history of wildfire in your area. Be aware of recent weather. A long period without rain increases the risk of wildfire. Consider having a professional inspect your property and offer recommendations for reducing the risk. Determine your community's ability to respond to wildfire. Are roads leading to your property clearly marked? Are the roads wide enough to allow emergency equipment to get through? Is your house number visible from the roadside? Have a safe place to meet if you need to evacuate your home or the area. Be sure you have practiced evacuating so you have no surprises if a "real" event actually occurs. If you get split up, make sure everyone knows who to contact outside your area (grandma or a close family friend). That way, you all have a specific individual to keep track of everyone even if you all can't keep up with each other locally. It does happen when things get chaotic. When I was in CERT training, we were taught that there are four different classes of fires. This is based on the kind of material that is burning. Class A fires are those that include paper, wood, cloth, other textiles and even rubber. Class B fires are those that include gasoline, propane, paint thinner and kitchen grease. Class C fires are those that include electricity, such as computers, panel boxes, car motors and electrical wiring. If the electricity is stopped and the fire continues, the class changes to Class A or Class B. Class D fires are those that include exotic metals such as magnesium and titanium. Fires can fall into more than one class. You can learn about Home Fire Safety with tips on how to store flammable products, what to do about alternative heating sources and information about electrical wiring (nothing too technical). This page has complete information about how to create your own Fire Escape Plan and a video showing how to correctly use a fire extinguisher. And, speaking of fire extinguishers...I just recently added a new page about Fire Extinguisher Safety where you can learn about which fire extinguishers to use to put out different kinds of fires and where they need to be located in your home. You will also learn about a fire extinguisher to AVOID. Have at least one fire extinguisher per what I like to call "danger zone". This could be your kitchen, garage, backyard shed, upstairs family room, pool room, etc. Think about the various areas where you keep anything or anyone that might need protecting or where a fire might erupt.